Enjoy absolute climate control within your home with Ecobee’s 4th Generation Smart Thermostat; monitor and control your home temperature from anywhere in the world. Nothing beats a nice, comfortable atmosphere within your home, and the temperature within your home is a crucial factor in achieving that comfort. Finding a good smart thermostat that is sensitive to temperature changes and that can respond effectively to those changes is a big challenge even with existing thermostats, such as Nest, Honeywell and others. But it is not about company size or popularity, but about getting the job done and effectively too. Since Ecobee entered the world of thermostat manufacturers, it has continually made its mark and gained ground in the thermostat market. 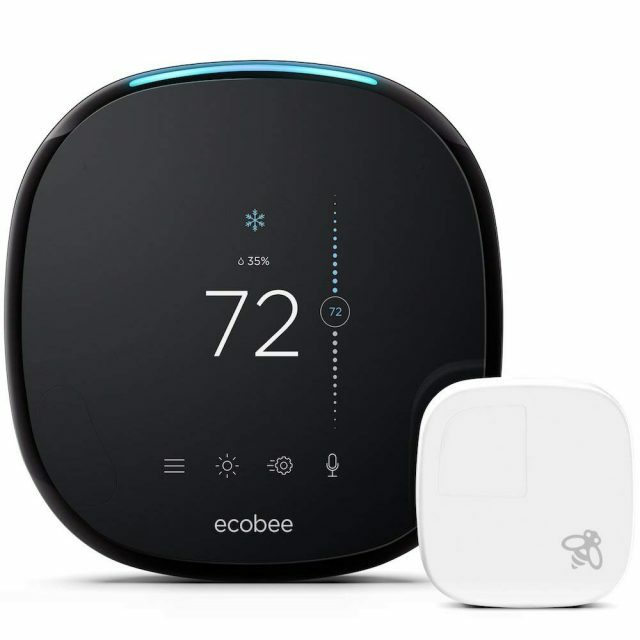 The Ecobee3 was a huge success and with the introduction of the Ecobee4 Smart Thermostat, they continue to establish themselves as a force to reckon with among thermostat manufacturers. Let’s take a look at the Ecobee4 Smart Thermostat. As usual with its thermostats, the Ecobee4 comes in a sleek design that fits beautifully within your home. With its crystal-clear LCD color touchscreen display, the Ecobee4 does more than just control your house temperature. Most thermostats only monitor and control the temperature in the area it is installed. But not the Ecobee4. With its unique sensors, placed in appropriate rooms and places in your home, Ecobee4 can monitor and control the temperature in all areas where the sensors are located. 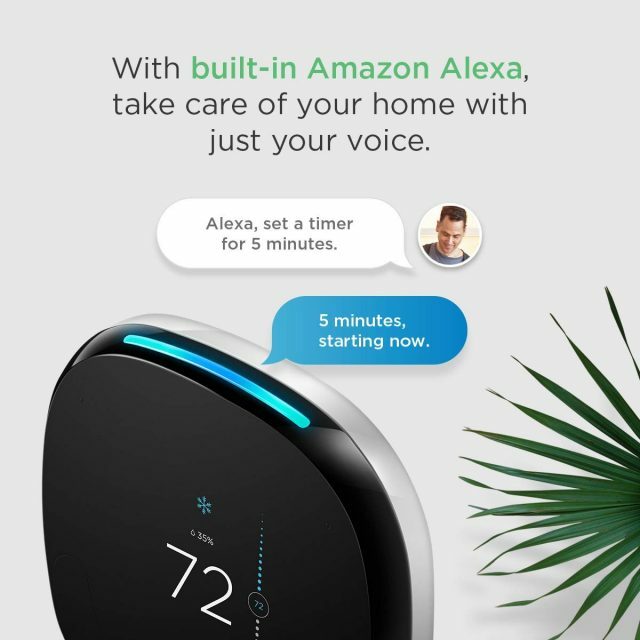 Another interesting addition to the Ecobee4, compared to its predecessor the Ecobee3, is the built-in Alexa function. This allows you to control the device and enjoy other voice-controlled functions through Alexa or Google Assistant. It has a built-in speaker that produces clear sound and the built in microphone can pick your voice commands even at relative long distances. And in case your HVAC needs a Power Extender to work with a smart thermostat, relax! 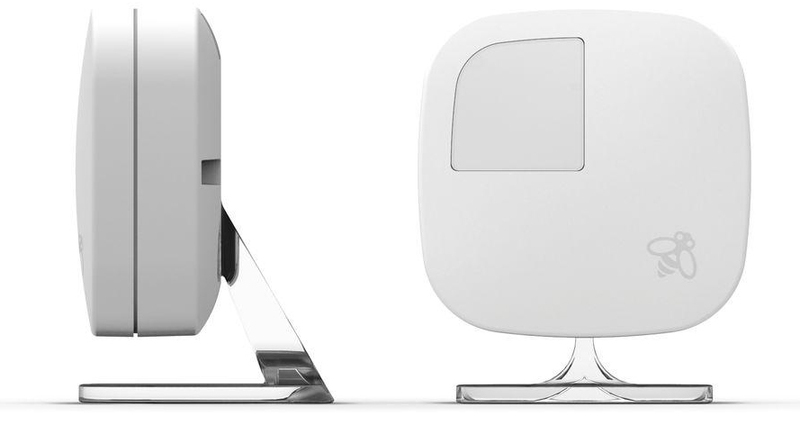 The Ecobee4 comes with one included. 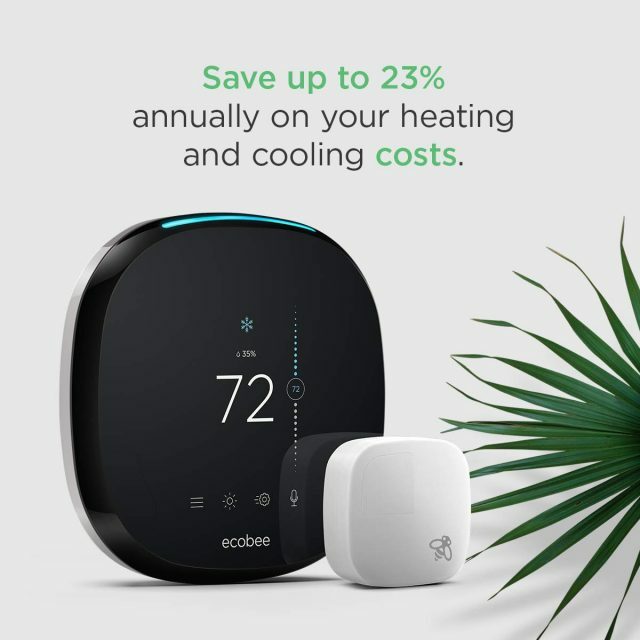 Ecobee4 is ENERGY STAR® certified and guaranteed to save you up to 23% annually in your heating and cooling costs. By comparing your indoor temperature with your outdoor temperature, and making intelligent adjustments to minimize the difference in these two temperatures, the Ecobee4 can help you make huge savings in heating and cooling costs. It weighs 4 x 4 x 1 inches, available in black color, and weighs just 2 pounds. The box comes with the thermostat, a sensor, a back plate, a trim plate, power extender kit (PEK), screws and drywall plugs, wire labels, and an installation guide. Get Your Ecobee4 Thermostat Now! The Ecobee4 Smart Thermostat has the same features as its predecessor, the Ecobee3, with the exception of the built-in Alexa functions. These features are explained below. Room Sensors: One of the unique features of the Ecobee4 is its room sensors. Unlike other thermostats that only measure and control the temperature in one place, the Ecobee4 can monitor the temperature in more than one place. 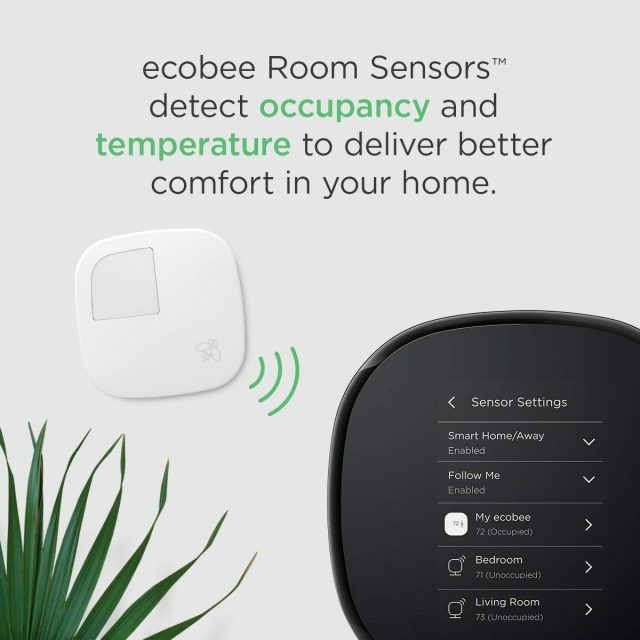 These sensors pair with the Ecobee4 to monitor and control temperature simultaneously and individually in each area where the sensor is placed. Previous model (Ecobee3 and Ecobee3 Lite) sensors are compatible with the Ecobee4. Simply remove the battery in those sensors and put them back and they will connect to the Ecobee4. One sensor comes in the box and it is recommended that you have more than one, placed in rooms/areas where you wish the thermostat to monitor and control. Additional sensors are available in 2 per pack. The sensor can monitor humidity, occupancy, temperature, and proximity. You can also choose which sensors are included in the Ecobee4’s Comfort Settings. This prevents any particular sensor from tipping the temperature scale. By aggregating the temperature across all sensors included in Comfort Settings, the thermostat can determine the appropriate temperature level for your home. 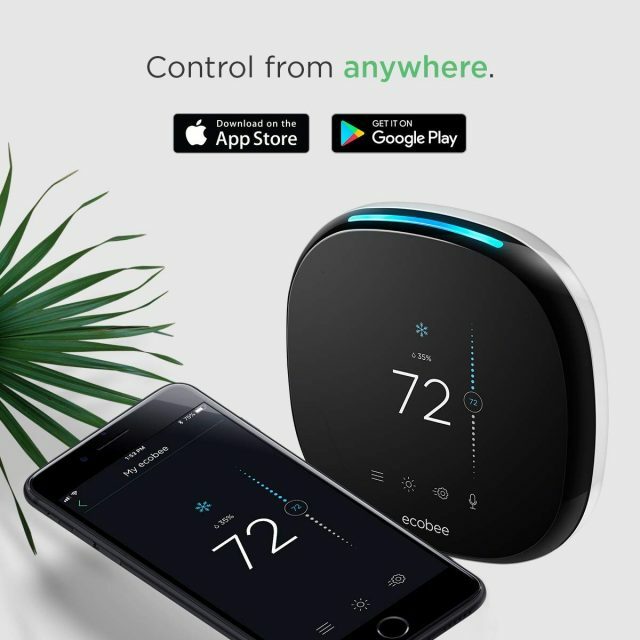 App Control/Universal Control: The Ecobee4 has a simple, yet fully functional app, that allows you to control the thermostat from anywhere in the world The Ecobee app is compatible with Apple and Android devices and can be downloaded from the appropriate app store of these devices. You can also control the thermostat from Ecobee’s website. 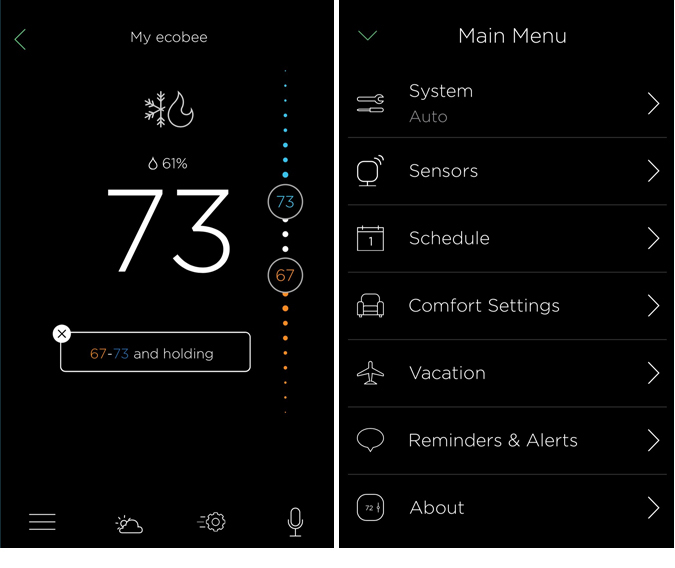 From the app, you can view and change current Ecobee4 settings, humidity, and temperature levels, volume control of the built-in mic and speaker, and set schedules and modes (such as Home, Away, etc.). The app also provides you with weather details, comparing the same to your home temperature. Alexa Built-In Control: Ecobee introduced built-in Alexa voice control with this model. You can, therefore, control your thermostat using voice. You can set a timer, change the mode, hear the news, or play music – all by using your voice. However, functions such as Pandora, SiriusXM, Spotify, Alexa Calling, Alexa Messaging, and voice control for Bluetooth devices are not available. Also, Alexa cannot control your HVAC. Alerts and Reminders: Given that you have set appropriate schedules (”home”, “Sleep”, “away”), reminders (e.g. change HVAC filter), holidays, and so on, you can receive alerts and reminders on the app as they become due. 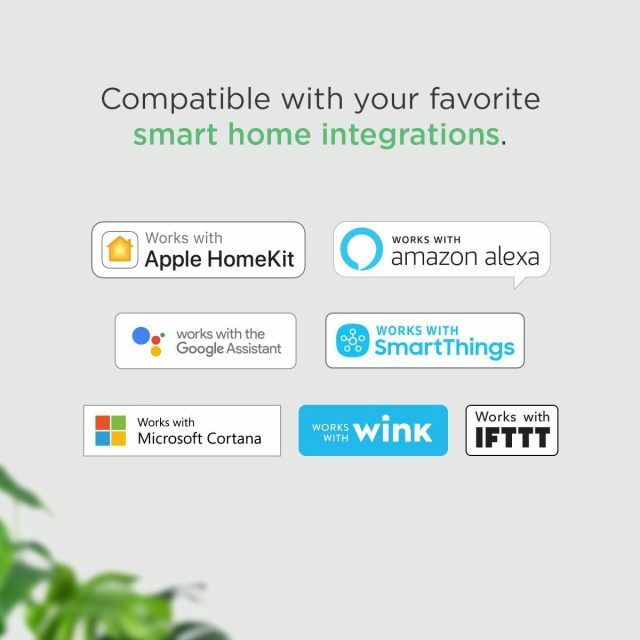 Connectivity: The Ecobee4 works with IFTTT, Apple Home Kit, Amazon’s Alexa, Google Assistant, SmartThings, and Microsoft Cortana. Installation and Setup: You require both physical and software installation to use the Ecobee4. The process varies, depending on your HVAC type – whether you might need a C wire installed or a power extender kit. 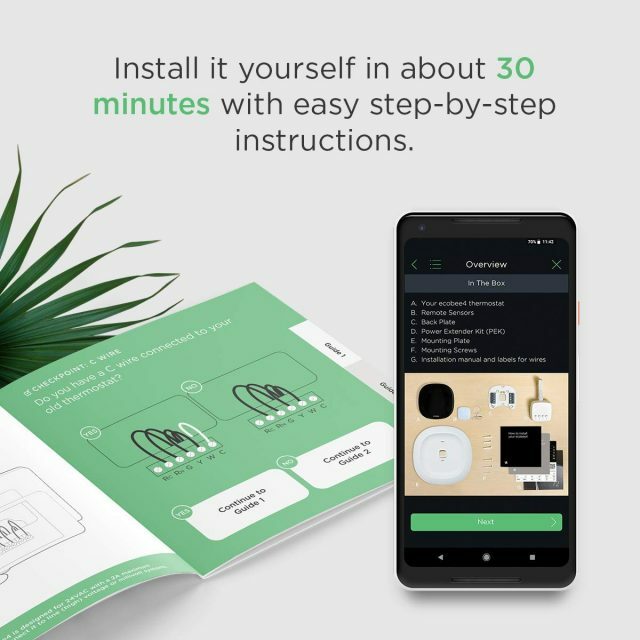 The box comes with an Installation Guide that provides you with step-by-step instructions to guide you through the installation process. 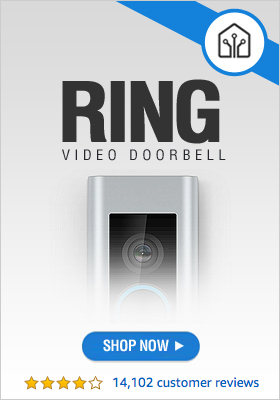 Regardless of your setup type, installation can be easily carried out successfully within 30 minutes. This Ecobee4 Smart Thermostat truly does what it is made to do and does it very effectively, justifying its price. Once installed and configured, you can literally forget it is there. It will do its job well without you having to adjust temperature manually or interfere in any way. With the Ecobee4, you can enjoy that serene and comfortable atmosphere in your home without any issues.